Karla Kastle was found emaciated and sick on the street in Flatbush. She was in such bad shape that vets initially thought she was ten years old! After a few months of TLC and a visit to the cardiologist, we learned that Karla is only a couple years old and is healthy and happy and ready for adoption! 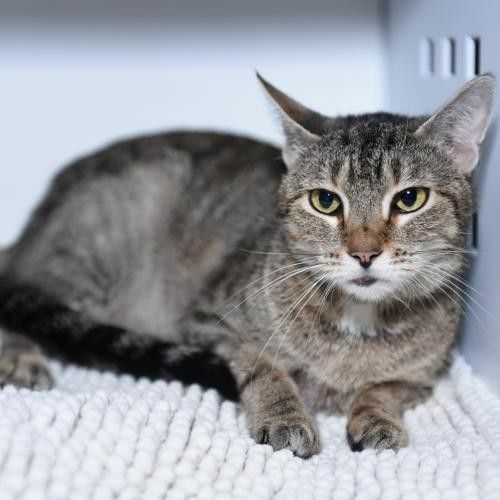 Karla would prefer to be your own and only cat although may be able to tolerate a quiet and considerate feline roommate. Karla is spayed, fully vaccinate and FIV/FeLV negative. She will be on daily heart medication for life, but it's very inexpensive and easy to administer.